Don’t like the standard sliver gray colored Apple iPad? 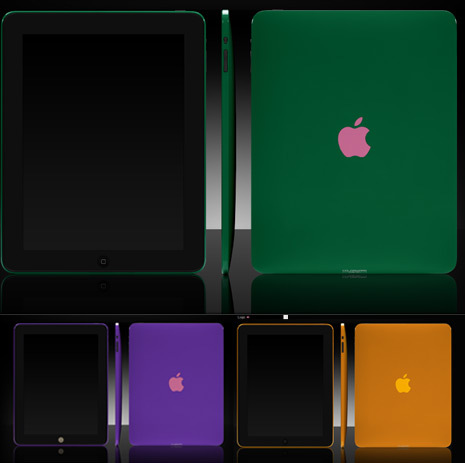 Well, you can get customized iPad with color of choice in few simple clicks at ColorWare. You can customize every part of iPad’s outer body with colors that you like. It allows you to customize the color of body, button, and even the logo. You can create any colorful variant of Apple iPad at ColorWare website. Just select either of body, button or logo option to customize color for respestive component. You can go for either gloss or softouch finish. You can preview the final colored iPad in 360 degree view. Besides customizing iPad, you can also use ColorWare for custom colored iPhone 3G and BlackBerry Bold. HOW DO YOU ACTUALLY START DESIGNING THE CASE BECAUSE I WOULD LIKE TO FOR A BIRTHDAY PRESENT IT’S ON WEDNESDAY !!! !